Spring is the time brands stereo-typically throw out shower-fresh scents that remind us of all sorts of "clean". This year however, there is only two new releases that caught my attention so far, and the rest in my rotation have been old classics. Which is quite strange for me because these sorts of scents are a minority in my very sizable collection. I'm a little bit of a fresh-scent snob in that I find 90% of them smell like one another, and will typically contain citrus and/or pome fruits (pear, apple, quince etc), along with delicate soft flowers like freesia, lotus, hyacinth, honeysuckle or peony, and a laundry-fresh musk note. 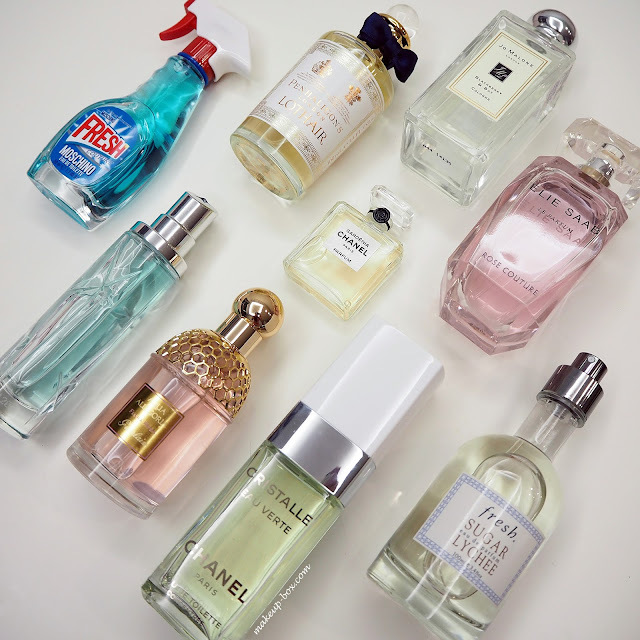 Not only do they have very similar odor profiles but half the time it seems they come in pale pastel pink juice because so often people gravitate towards a scent based on how it appears in the bottle. (Looks nicer on the dressing table, or on Instagram.) And after that, all it takes is for the scent to be pleasant and inoffensive, nothing too adventurous, to close the sale. The top sellers in Asia ALL have extremely similar odour profiles. Versace Bright Crystal, Miss Dior Blooming Bouquet, Chanel Chance Eau Tendre, Marc Jacobs Daisy Eau so Fresh are what I call the "Pink Ladies". Most of them contain peony or hyacinth, some citrus fruit, and a clean musk/water note. Moschino Fresh Couture - wins for coolest bottle. The juice inside actually isn't all that unique. It's a pink lady in a funky blue dress. You've got the requisite peony and mandarin, but the addition of lime and raspberry gives it a more pronounced fruity, sweet 'n' tart hit, which is quite lovely. Penhaligon Lothair - I have a full post on this scent. It's a mysterious but luminous tea-based scent that balances smokiness with crisp, cool cleanliness. There is enough freshness (lavender and bergamot) to make it perfect for Spring, but there's a depth and intelligence to it. Wear this if you absolutely do NOT want another Pink Lady scent. Jo Malone Blackberry and Sage - simply, but so faceted and non-generic. This masterpiece is worthy of the Jo Malone price-tag in my opinion. It's got the tartness of blackberries but more herbal and woody-clean than fruity. If you want a fruity scent that is more aromatic than sweet, shimmy over to this one. Elie Saab Le Parfum Rose Couture - looks like a Pink Lady, but it's not. This is the only scent in this list that is on the slightly sweeter headier side. It's more a Valentines' scent than a Spring scent. Rose is the star, and rose scents can be a bit old-fashioned and too syrupy and heady sometimes. But the peony lightens it and gives it a translucency, without stealing the show. This is a very modern take on rose, and something I would recommend to those who have mostly avoided rose fragrances because of the reasons above. Chanel Gardenia - ahhh, the grand dame of soliflores (single-flower fragrances). Gardenia is a classic that is almost 100 years old. And I love it. I don't always love Gardenia scents - they can give me a headache, but this one is like a velvet petal. It's got presence but it's not loud or overly-simplistic, and it just smells so posh and ladylike. Thierry Mugler Innocent - originally Angel Innocent, this was renamed to Innocent because it really doesn't resemble the original Angel that much, and has its own fiercely-loyal fan base. If Angel is a rich syrupy fruit cake studded with dried plums and raisins and drizzled with cocoa, this is a bowl of tart blackcurrants and red berries with a thin shell of crispy meringue on top. It's flirtier, fresher, not so sticky and rich, and much easier to get along with. Guerlain Aqua Allegoria Flora Rosa - red berries and a soft musk makes this rose very delicate and girly. Nothing heavy and old-fashioned about this one. I pick this one to mention but honestly any one of the Aqua Allegorias makes a fantastic spring fragrance. They are simple, fresh, good quality, and those bottles are to die for. Chanel Cristalle Eau Verte - compared to all its more famous sisters, most people probably don't even know of Cristalle Eau Verte. Well I'm telling you to give it a sniff if you like super-fresh citrus scents that have some complexity. I.e. it smells like a proper perfume, not like you drizzled a cut lime on yourself. This is a super-refreshing lemon and lime duet that is completely non-sugary. There is a bit of orange blossom in there to add a hint of sweetness, and some clean musk to give some depth and prevent it from smelling like a sorbet. Fresh Sugar Lychee - this is an old fave of mine, and I've turned quite a few readers on to it over the past couple of years. This contains lemon, lotus and lychee. It's a great perk-up on sunny days, and a bit different from the typical fruity scents because of the prominent lychee note. Fine fragrance it is not, but fresh, super-wearable, super-likable? Yes. Typically these are fragrances that are top-loaded - meaning they smell great in the first 30 mins to an hour, and then die down to a skin scent and disappear right after that. In my opinion they are meant to be sprayed liberally and touched-up throughout the day, and I have not met many that have stuck around for more than 3-4 hours with the exception of the Penhaligon's and Thierry Mugler. The Apple iPad group will constantly exist at hand to sustain you concerning your concerns Viva Video Download Merge clips right into one tale with several incredible & expensive collection templates. The best notes for Britney Spears Radiance are wild red berry and dewy petals. The mid notes have a satisfying African orange bloom,dermastir, dermastir gold iris, jasmine and white tuberose.